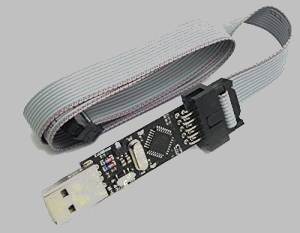 The Arduino Micro uses a single ATMega32u4 chip that manages USB communications and executes sketch code. The memory is split into two partitions, one for the bootloader software and the remainder for the sketch. It appears that, for a variety of reasons, the bootloader memory can become corrupt and the symptom is that it does not respond when connected to a PC or it continually changes USB COM port number. When it is not recognised at all, Windows PCs show the "USB device not recognized" error and set the device as "unknown". Using the lsusb command in Linux shows that nothing appears to be connected. However, the Micro may continue to run whatever sketch is loaded, but new sketches cannot be downloaded. Problem! The procedure below applies specifically to using an Uno as a bootloader program to fix a broken Micro. Since the Micro and Leonardo are very similar it may work for the Leonardo too. If you have different combinations of boards, the process will be similar but please refer to the documentation for your board and remember to set the board parameters accordingly. Connect the Micro to the Uno and the Uno to your PC as shown here. Do not connect the USB on the Micro to your PC, it will be powered by the Uno. 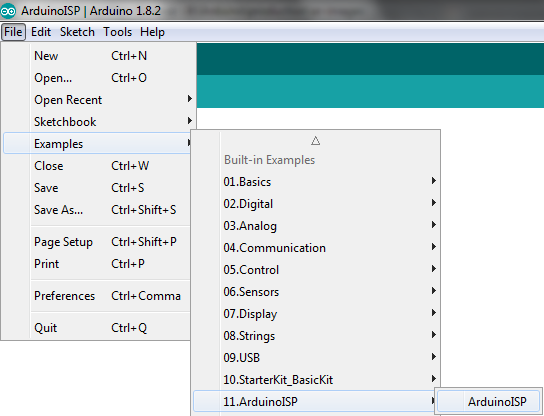 Open the ArduinoISP sketch from the Examples that are provided with the IDE. 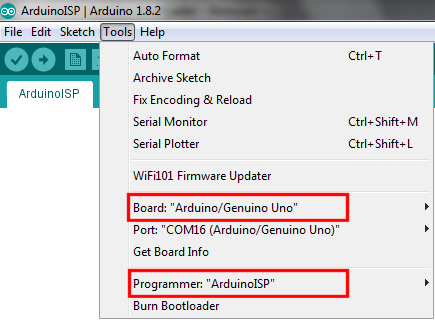 Change the settings in the IDE as shown here: you are programming the Uno with the bootloader sketch and using the ArduinoISP to load it. Your COM port will most likely be different. Compile and upload the sketch. Change the settings in the IDE as shown here: you are now targetting the Micro so you need to specify which bootloader file the IDE should pass to the Uno in order to load into the Micro. The Arduino is the programmer so set it to Arduino as ISP. Now, under Tools, click Burn bootloader. This will take a while, perhaps 90s or so. The RX and TX LEDs will show the data transfer activity and when the transfer has finished the LED on the Micro should be blinking slowly and the message "Done burning bootloader." will be displayed in the IDE. The process is now complete and you can disconnect and use your Micro again. If you wish to keep the Uno as a permanent rescue device, you can fix future Micro problems by connecting up and starting at Step 4. 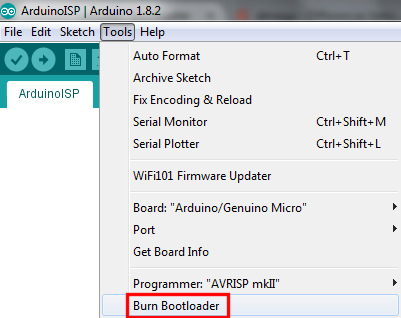 The bootloader sketch, as provided, has some additional features that you might find useful. 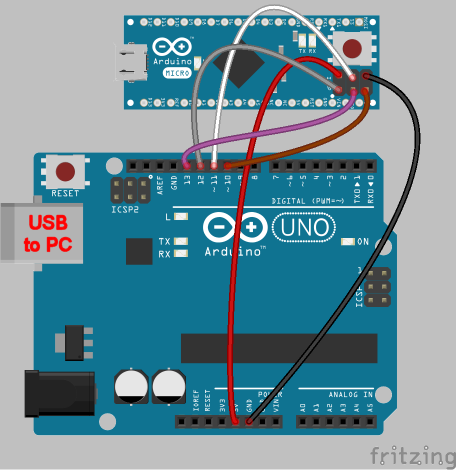 By connecting three LEDs with suitable resistors (something like 330Ω or 470Ω) to pins 7, 8 and 9 the sketch will show when the Uno is communicating with the Micro, an error condition and a heartbeat to show the programmer is running. This is all documented in the sketch's source code. Most AVR chip models can reserve a bootloader region, of perhaps 256B to 4KB, where this re-programming code can reside. When the processor is reset, the bootloader runs first and checks whether to download a new sketch from the IDE and replace the current sketch or to jump to the main sketch that is already programmed. If you buy blank ATMEGA32u4 processors then these will really be blank and you will need to load a bootloader program before you can use them with the Arduino IDE; just follow the steps above but you will need to put the processor in a suitable DIL socket and wire it up correctly or put it in an Arduino Uno or some other board with a DIL socket.